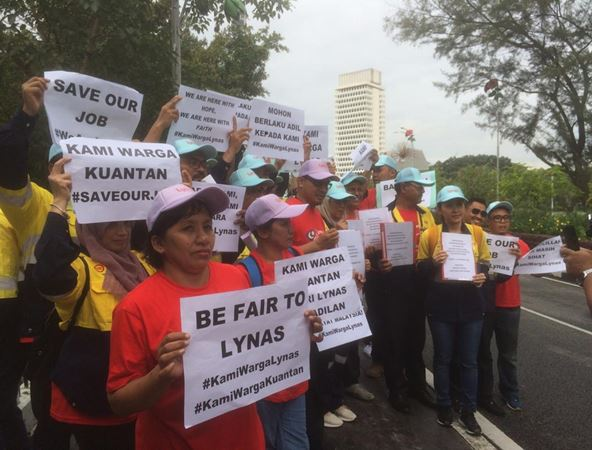 Lynas employees at the entrance of the Parliament building today. AH! The twists and turns of world’s only non-Chinese rare-earth producer, Lynas Corporation Ltd’s battle for survival in Malaysia has gotten ever so interesting these past few days. Apparently, the controversial do-this-or-close-shop pre-conditions that were set upon the company by the Ministry of Energy, Science, Technology, Environment and Climate Change (Mestecc) were not in tandem with the Cabinet’s position on Lynas. Mestecc Minister Yeo Bee Yin was said to have acted in silo when she ordered Lynas to export its water-leaded-purification (WLP) residue, which the scientific committee that she formed to scrutinise Lynas, said was safely stored in its plant in Gebeng, Pahang. 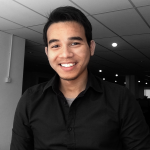 On Monday, Entrepreneur Development Minister Datuk Seri Mohd Redzuan Md Yusof revealed that the Cabinet has yet to make any firm decision on the export of Lynas’ waste adding that Yeo’s directives could sour bilateral relations with Australia. “We cannot just simply force someone to take back waste. That is not the condition of the contract. As it is now there is no indication, as far as I know, that the plant’s operation is unsafe,” said Redzuan. Yeo had consistently claimed that the directive for Lynas to export its WLP residue was done based on the precautionary principle (PP), a risk-coping strategy that allows decisions to be made in areas where scientific understanding is yet sufficient. She argued that PP was employed in Lynas’ case – despite the all-clear given by the scientific committee to the company’s operations and waste storage facilities – due to concerns over widespread contamination should a leak occur. 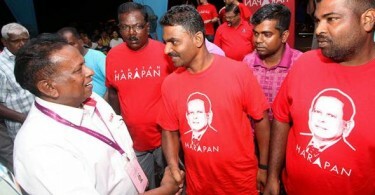 “Is there any guarantee that no harm will come to the public if Lynas is flooded? We want to reduce risks,” said Yeo, at a forum last month, when she was asked why her directives contradicted the committee’s recommendations for Lynas. To the unfamiliar, the committee recommended Lynas to permanently store its WLP residue. The company must only export the residue if it fails to locate a suitable site to build the said storage. Lynas is currently in the midst of preparing the facility. The fear which led to the use of PP sort of makes sense, at least until one realised that the material which Lynas uses is classified as a naturally occurring radioactive material that in a simple search via Google Scholar fetches a total of 544,000 journal articles. So basically there are over half a million scientific studies on naturally occurring radioactive materials and yet Yeo still decide to employ PP? Even more peculiar was the fact that the committee explicitly stated that the temporary storage facilities of the WLP is “perfectly managed”. Surely the six experts in the committee have factored in heavy monsoon rain when assessing the facility, right? But even if the WLP residue does leak due to flooding the Atomic Energy Licensing Board (AELB) had, in December last year, ruled out the risk of widespread contamination as the mild radioactivity of the residue will simply be diluted by the flood water. “The clay liners of the WLP storage will prevent leaking and leaching of materials into the ground. But should it leak and spill over into the retention pond, the radioactivity of the WLP residue will be diluted thus bringing the radiation levels down,” said AELB. Not entirely surprising, Lynas’ critics continues to harp about the issue, with two non-governmental organisations urging the government to compel the company to export its WLP residue due to the presence of thorium and uranium within it. Their argument however, was debunked by radiochemistry expert and AELB former chairman Professor Datuk Dr Sukiman Sarmani; and physician Datuk Dr Looi Hoong Wah, who has 40 years of experience and interest in nuclear medicine and particle physics. The two experts pointed out that the small amount of thorium and uranium in Lynas’ WLP residue are not man made but naturally occurring radionuclides found in soil, water and in food. “Uranium-238 and Thorium-232 (the elements in the residue) will always remain as naturally occurring radionuclides even after a physical or chemical extraction process. Radiation risk is not dependent on the presence of the radionuclide but the mode of exposure and the exposure levels,” read the duo’s statement. But the weirdest part of this drama is when the Parliament was told that Yeo had, on February 26, written to her Australian counterpart, asking the latter to collaborate with Malaysia in the exportation of Lynas’ residue. Wait, what!? Does Yeo not know that in western countries, it is a big no-no for government to meddle in the affairs of business entities? And today, Prime Minister Tun Dr Mahathir Mohamad said that Lynas can stay as long as it can ensure that its residue are harmless, which, essentially, was what the committee had been telling the government all along. Phew! What a party we’re having.